April « 2015 « Geekorner-Geekulture. Another week, another batch of episodes. Going to be shorter about most this week, as I’ve wasted some time elsewhere. Some shows are finally “starting”, while most others are going as they did before, for better and for worse. 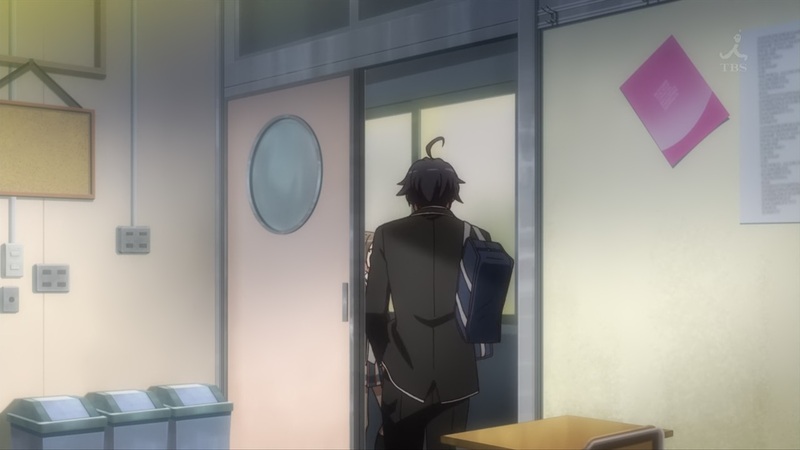 Another episode of OreGairu S2, another monstrously long and in-depth breakdown by myself? You don’t say! I might have gone overboard, as I think this is my longest episodic write-up to date. Just like with NagiAsu back in the day, breaking down social interactions is interesting. It’s something we all live and breathe in, and take for granted, so supposedly it shouldn’t take much space. But, there’s nothing that’d take more space were you to actually break it down. 3 Comments Posted in anime, Anime Power Ranking Tagged Blood Blockade Battlefront, Fate/Stay Night: Unlimited Blade Works, Food Wars! Shokugeki no Soma, Kekkai Sensen, Knights of Sidonia S2, MY love STORY! !, My Teen Romantic Comedy SNAFU, Ore Monogatari, OreGairu, Plastic Memories, Punchline, Sidonia no Kishi S2, Yahari Ore no Seishun Love Comedy wa Machigatteiru. What do we have? We have another breakdown between Hachiman and Yukino, over some disagreement in how they do things, in how Hikki hurts himself and everyone around him to defuse the situation rather than actually resolve the underlying issues. 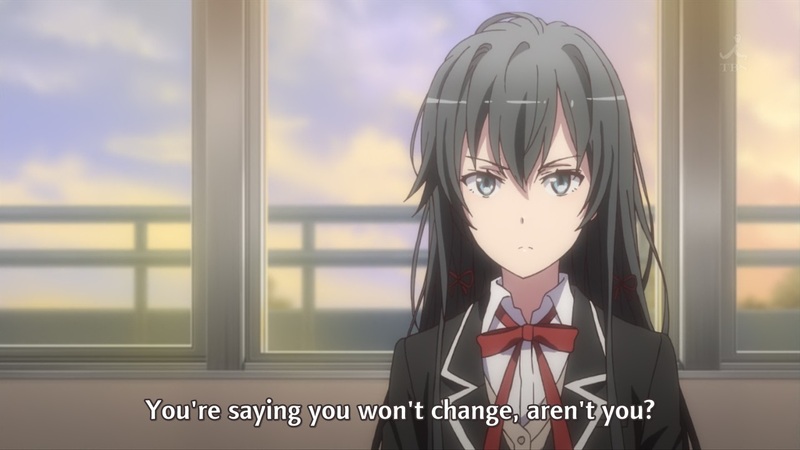 But what Yukino and Hachiman do isn’t too different on some level – Hachiman is going to try and make Iroha lose by shouldering everyone’s hate, and Yukino is going to make Iroha lose by shouldering this responsibility she doesn’t care for, by becoming the next student council president. They both make themselves into martyrs. “Nothing changed,” but they only hurt further and further, and everyone around them knows it. 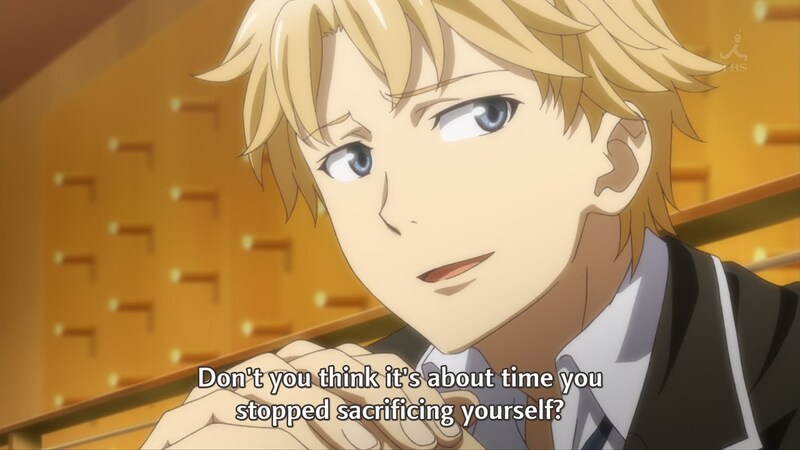 Hayama’s “Is that so?” could refer to any and all of Hachiman’s statements, let’s go in reverse order, because the reasons became less revealing and incisive as Hikki kept bringing them up, “I’d like to at least chill during the weekend” shows that Hachiman doesn’t want to help, and engage with others, that he’s an introvert and that helping others comes at a cost to him, or rather, that he finds it stressful. 14 Comments Posted in anime, Episodic Notes Tagged My Teen Romantic Comedy SNAFU, OreGairu, Resisting Change, Teen Suffering, Yahari Ore no Seishun Love Comedy wa Machigatteiru. This was not a good week. Not for my mood, and sadly, this week’s bounty of shows had done very little indeed to improve my mood, with most shows being underwhelming if not flat out bad. Knights of Sidonia episode 2 wasn’t watched this week, so it’d appear in next week’s write-up. Well, another episode where I had a lot to say. This seems to be the trend with OreGairu this season. Thankfully, the other trend is that the show continues to be very good this season, building on everything that went on up to this point, and taking it further, without holding back its punches. 9 Comments Posted in anime, Anime Power Ranking Tagged Arslan Senki, Blood Blockade Battlefront, Fate/Stay Night: Unlimited Blade Works, Food Wars! Shokugeki no Soma, Kekkai Sensen, My Teen Romantic Comedy SNAFU, Ore Monogatari, OreGairu, Plastic Memories, Punchline, Sidonia no Kishi S2, Yahari Ore no Seishun Love Comedy wa Machigatteiru. So, we’re already past an arc! The first arc doubled down on reminding us why the characters work as they do, and gave us insight as to their characters – they’re lonely, even as they cling to others. They’re suffering, and they hate themselves. But they, like everyone else, has to make do with the situation they’re in, which includes lying to themselves about their suffering, and thus, hating themselves even more. 1) “But I think any news is better than no news.” – Hachiman is bored. You know why he’s bored? Because he’s alone, because no one will interact with him, or make him part of their activities. Though it goes both ways, it means he’s not going out of his way to interact with others. As he keeps demonstrating, he thinks his only real strength is his loneliness, so he will not let it go. 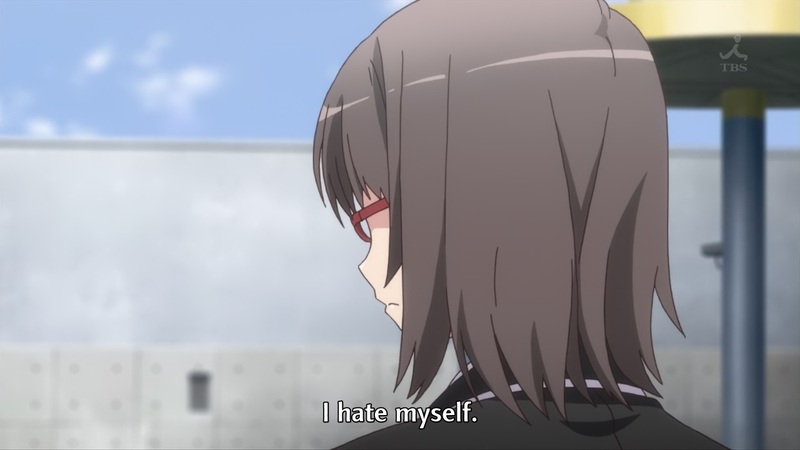 13 Comments Posted in anime, Episodic Notes Tagged Emotional scars, My Teen Romantic Comedy SNAFU, OreGairu, Teen Suffering, Yahari Ore no Seishun Love Comedy wa Machigatteiru. The season started! Premier write-ups for Punch Line, Ore Monogatari!! (My Love Story!! ), and Sidonia no Kishi S2 (Knights of Sidonia), and episode 2 write-ups for everything else. While most episodes this week were decent, I felt it was weaker than last week. I sure had a lot to say about this episode. I mean, here’s a full episodic notes post for it, and here’s a lengthy post-episode editorial detailing the show’s breakdown of self-loathing, and how it relates to the wish of maintaining the status quo, and both leads to self-loathing, and is one’s “punishing” of one’s self for said self-loathing. This season seems to go straight for the jugular in how much it directly attacks the manner in which the characters are built, and how they interact with one another. Or perhaps I just notice it even more since it builds on all that came before. 4 Comments Posted in anime, Anime Power Ranking Tagged Arslan Senki, Blood Blockade Battlefront, Denpa Kyoshi, Fate/Stay Night: Unlimited Blade Works, Food Wars! Shokugeki no Soma, Kekkai Sensen, Knights of Sidonia S2, My Teen Romantic Comedy SNAFU, Ore Monogatari, OreGairu, Plastic Memories, Punchline, Sidonia no Kishi S2, Yahari Ore no Seishun Love Comedy wa Machigatteiru. So, what did we have this episode? What did we really have this episode? First of all, we’ve had “someone acting strange.” Hachiman was speaking of Hayama not being his usual effusive and helpful self, and rather being unhelpful, but watching the episode you also have Ebina acting somewhat weird and giving off “sad vibes”, and Miura actually being aggressive for the sake of others. 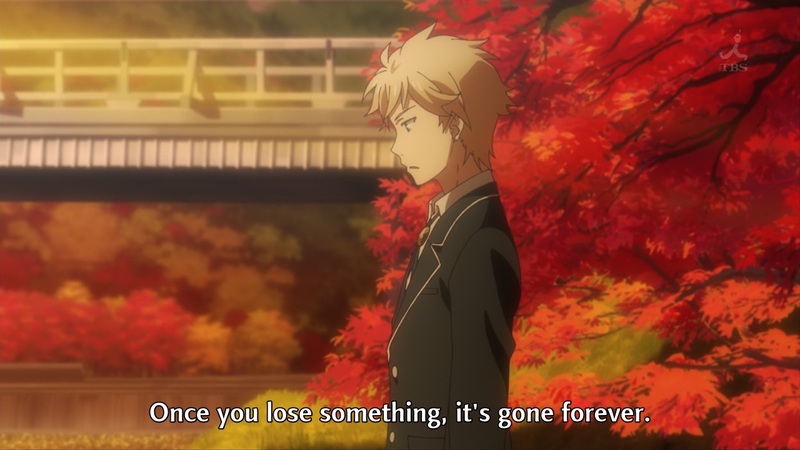 And you have Hachiman and Yukino hold onto the note they pass for too long. That last one seems irrelevant, but that is the point. Everyone is acting “weird”, because everyone is trying to deal with the tension of desiring for the status quo to remain, because everything else is scary and you risk losing what you already have, and the constant desire to have something better, something more. In terms of a community, this struggle is a bit more complex, but still similar, and ranges the gamut from desiring your friends to be happy in the status quo, to them being happier if things change, to the risk that not only your friends will not be happier if things turn out badly, but that as a result everyone else will suffer as well. 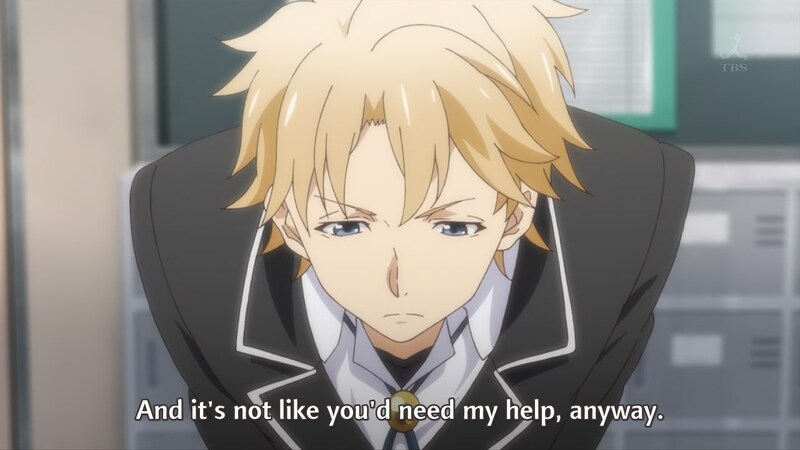 22 Comments Posted in anime, Episodic Notes, Things I Like Tagged My Teen Romantic Comedy SNAFU, OreGairu, Self-loathing, Teen Suffering, Yahari Ore no Seishun Love Comedy wa Machigatteiru.